VDI has seen tremendous growth over the past few years as organizations look to securely and cost-effectively support their ever-increasing mobile workforce. Now VMware is introducing Horizon Cloud, making it easier than ever to deliver on-premises or cloud-hosted virtual desktops and applications from an easy-to-use control plane in the cloud. In this webcast, you’ll learn how your organization can reap the many benefits of virtual desktops and applications with the speed, simplicity, and predictable pricing of a cloud service. Today, enterprises need to consider more than a company’s current needs; they must also look ahead toward how to best accomplish digital transformation. And client virtualization technology plays a key role in such progression of managing applications and desktops. Discover how a variety of vendors compare and the reasons why IDC named VMware a Leader in the IDC MarketScape for Virtual Client Computing Software for the second straight year – with VMware leading the scoring in both strategy and capability. - Which vendors offer the best client computing solutions with a commitment to long-term end-user computing innovation? 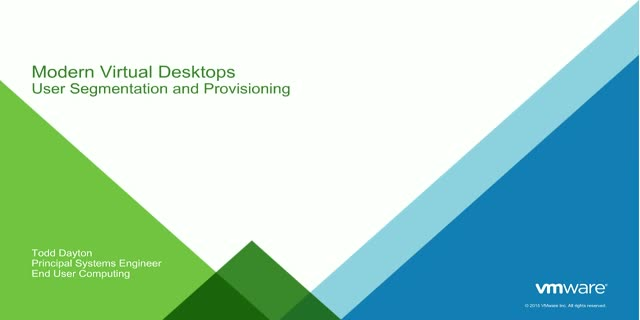 And more about what key factors differentiate the VMware EUC product portfolio from the competition. In the past, every user had a single desktop. That’s all IT had to worry about – how to manage that single desktop. But now, end-users are more remote than ever and they have multiple devices, many of them non-Windows devices. IT has to manage all of those devices and keep the corporate network secure. VMware Horizon Air Cloud-hosted and Horizon Air Hybrid-mode are a great solution for organizations looking enabling this mobile workforce, but want a solution that enables them to drastically simplify management, while moving to an OPEX model. Join us in this session where we will showcase how Horizon Air can help you meet the needs of your end-users. The digital workspace is the defining model for end-user computing in the mobile cloud era, securely delivering anytime, anywhere access to any application to any device including desktops, smartphones, and tablets. This session will provide strategic guidance to the major trends shaping the market and how VMware is delivering the innovation and market leadership across desktop, mobile and cloud infrastructure solutions, making the digital workspace a reality. Deploying virtual desktops and apps on-premises can be costly, and the complexity often associated with desktop virtualization has caused some organizations to think twice. In this webcast, we’ll discuss the new VMware Horizon Air Hybrid-mode, which combines the economic benefits of the cloud with the simplicity of hyper-converged infrastructure. Join us and learn a new way to think about VDI.